Hallowe’en – or Samhain a pagan celebration midway between the autumn equinox and winter solstice, a time when the spirit world intersects this one, the dead were welcomed back into the home and offerings of food made to safely see through the oncoming winter. People pass through the neighborhood as mummers or guising to move amongst the ghosts and faeries. English and American: same language different vocabulary. 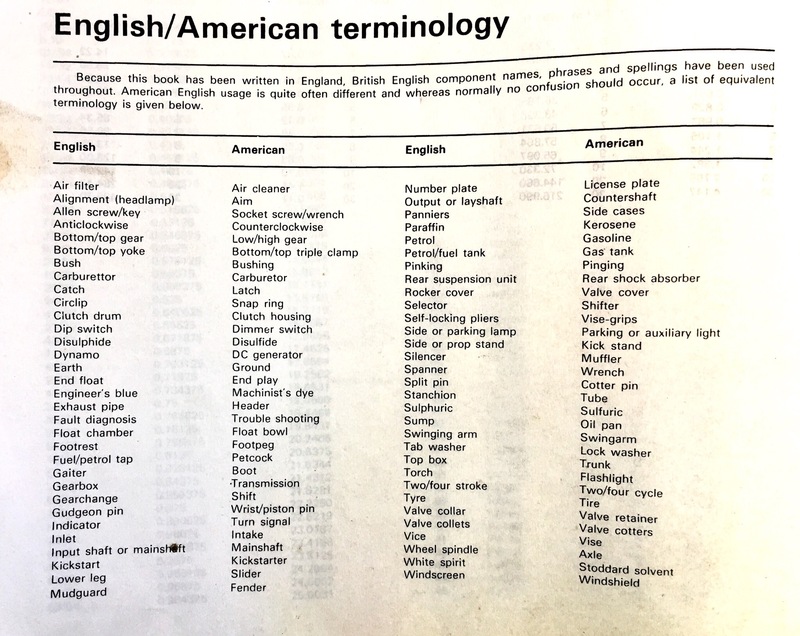 The rear page of a Triumph Haynes manual includes this handy-dandy translation key for motorcycle mechanics. The Wolverine – we watched Logan last night. The final outing of Hugh Jackman as the X-Men clawed heavy. 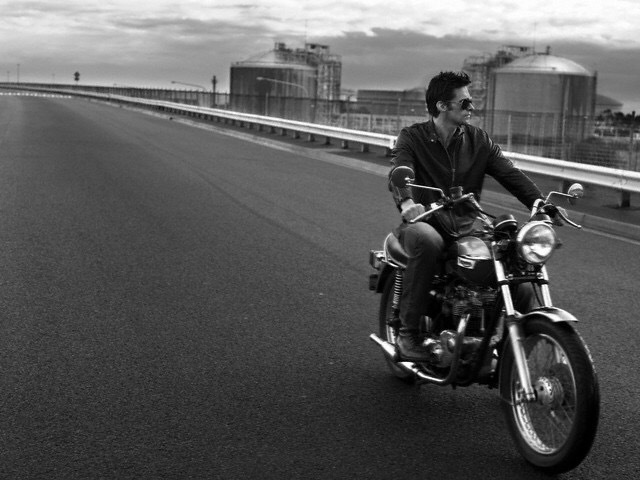 Here is an atmospheric black & white photo of the actor riding a 70’s Bonneville along an empty industrial backdropped highway. A side note: I am one eighth Logan. Profile – right to left and the windblast in your hair. 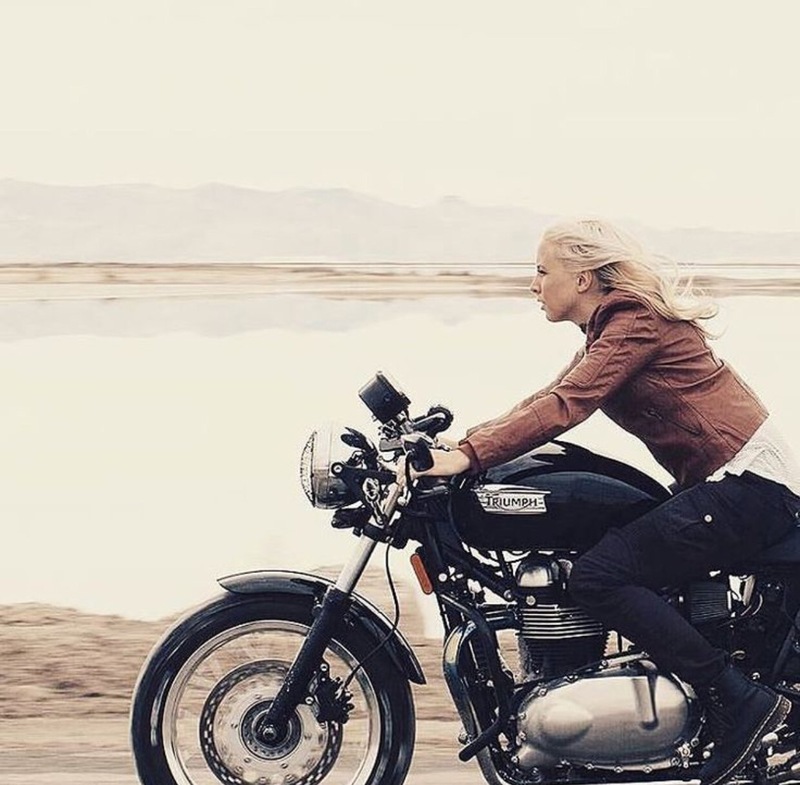 White landscape rushes along behind a black Thruxton. ¡Ay Caramba! 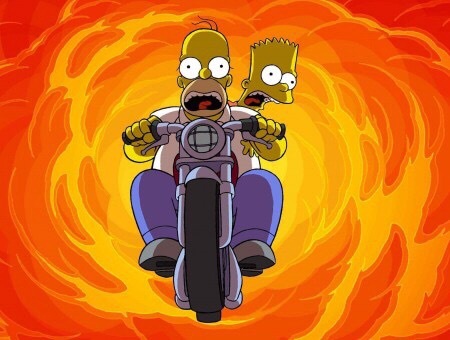 – The voice of Bart Simpson is 60 today. Nancy Cartwright vocalizes this cheeky misbehaving brat. 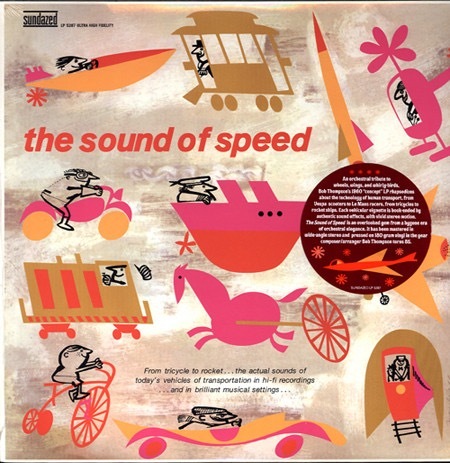 Vinyl LP – fun graphics in cheery colors and swift illustrative gestures for the period cover artwork on a 1960 record. What would you rather Bee or a Wasp? Sunshine Yellow – sublime automobile parked at Twin Lakes WI. 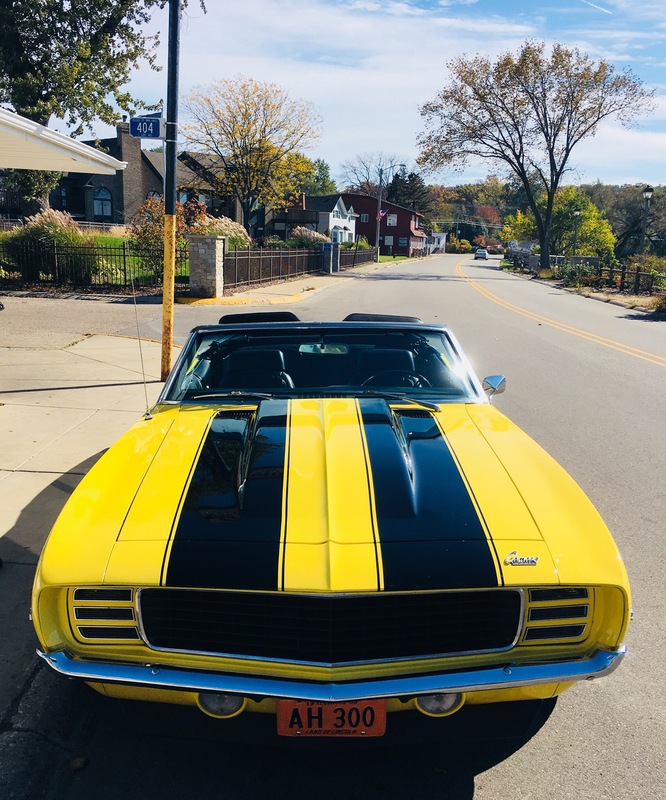 350 Chevy Camaro. RS package with Soft top, hidden-headlights, Hurst 4 speed shifter, big V8 engine. Originally developed and sold as a strong reactive competition against the Ford Mustang. I prefer these muscle cars. 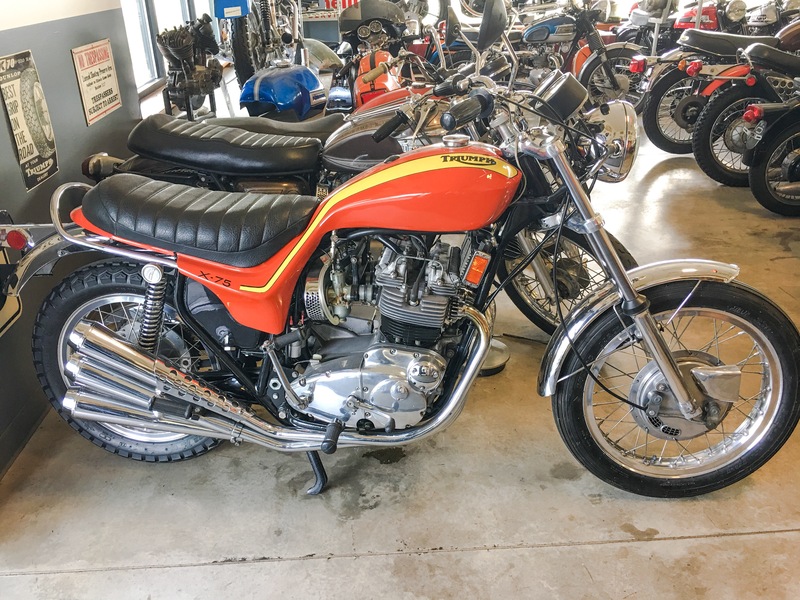 Triumph by Vetter – these a lovely looking machines.. a combination of the BSA triple engines and the sleek bodywork of Craig Vetter, visionary motorcycle designer. 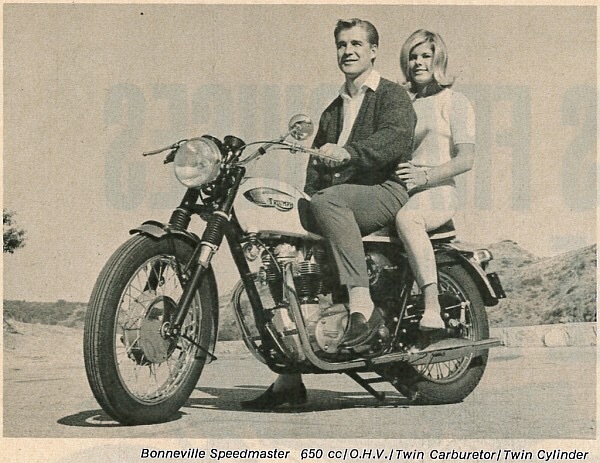 These saw limited production for the US market to create a trendy look whilst the early Japanese superbike invasion was underway. The color scheme, three into three exhaust, and a solid looking motor give it a confident roadworthy air. All Fall in – we’re still experiencing unseasonably mild weather for late October day. A good ride out was planned, undertaken and enjoyed. We stopped off at Morries Place in Ringwood McHenry County before a 40 mike sojourn into Wisconsin. I always enjoy peering at the old stuff Ed Zender has in his ‘showroom’ . 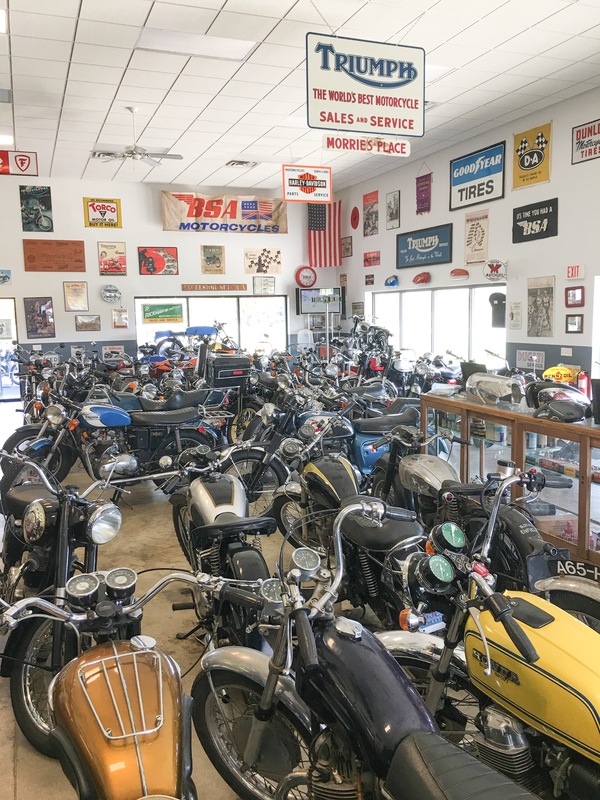 A sample of vintage ‘cycles from the 30’s to the 70’s. The signs on the walls a suitable backdrop too. 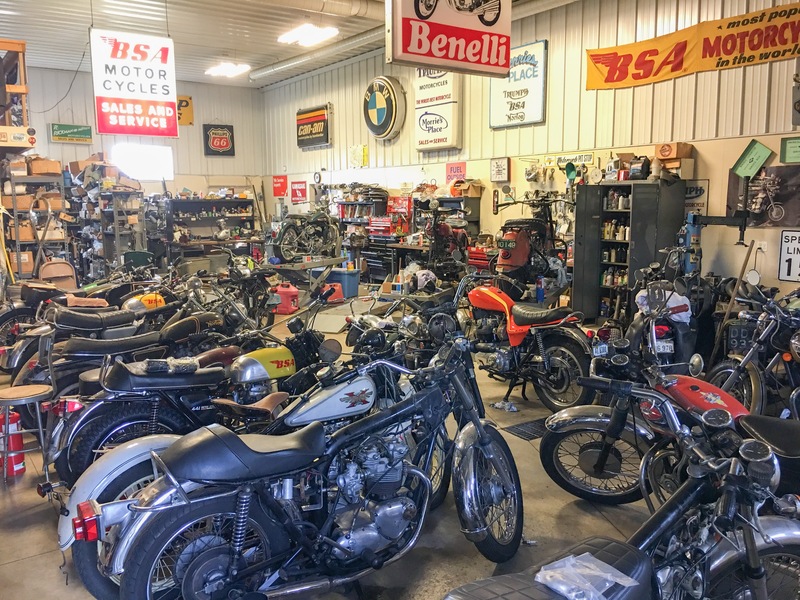 His workshop is lined up with many projects, maintenance jobs and carefully catalogued and shelved parts. Flowery Friday / British TV presenter Anthea Turner is draped florally over a maroon & silver Bonneville for some 90’s photo shoot. 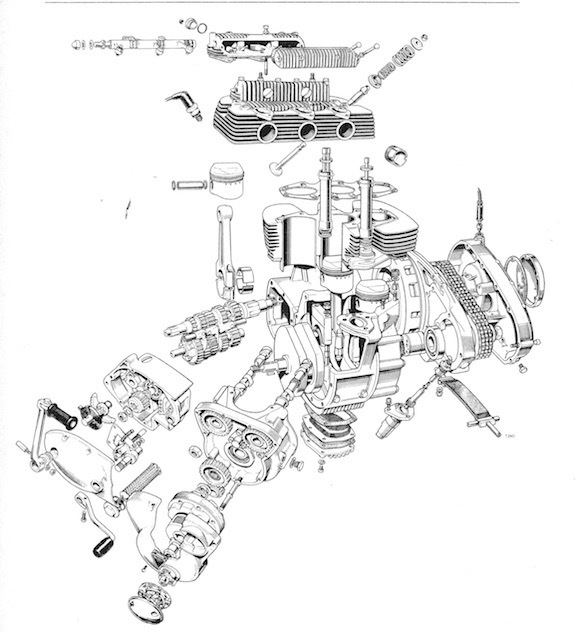 Technical Exploded Drawing – parts in a state of disassembly. I always like to see how the engineering draughtsman put the components together in a form so you can visualize how they fit together. 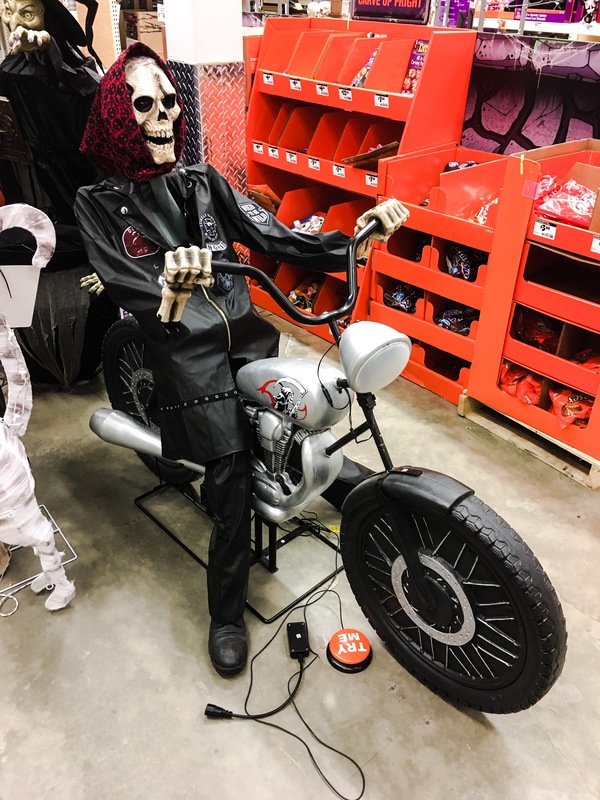 Mort – spooky custom in a SoCal style by Don Cates. 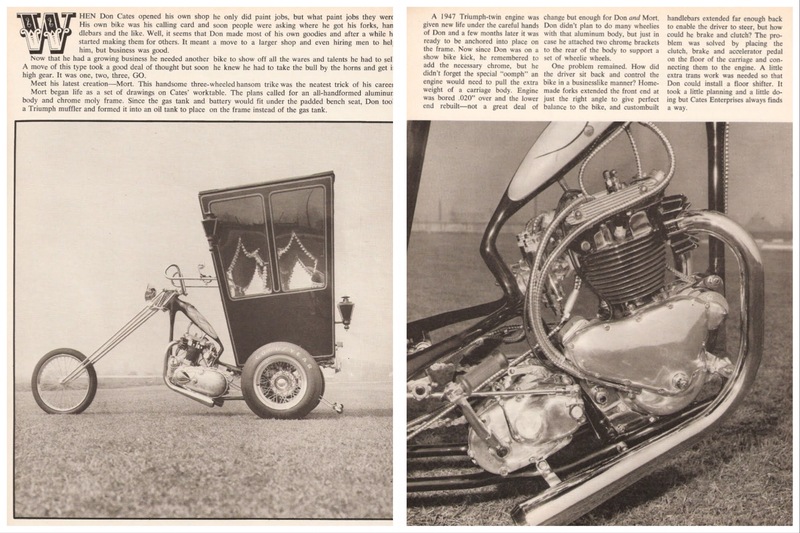 The hearse-like carriage on this Triumph three wheeler Hansom with extended fork is pure sixties. 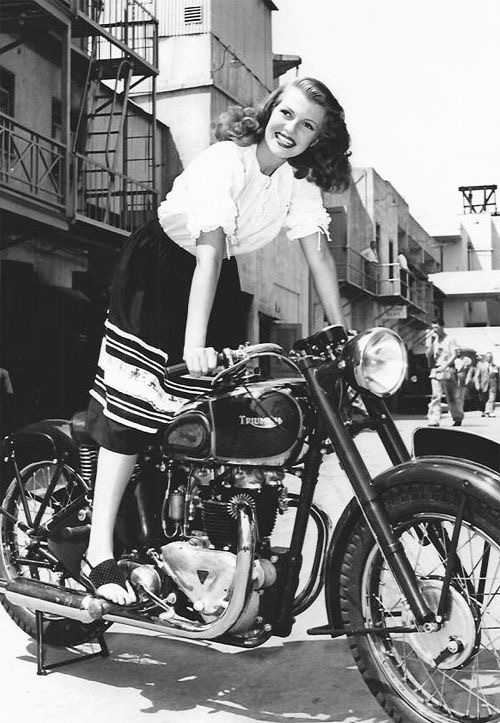 Gilda – actress, dancer and wartime pin-up Rita Hayworth would have been 99 today. 40’s femme fatale she headlined many of the top films of the day. 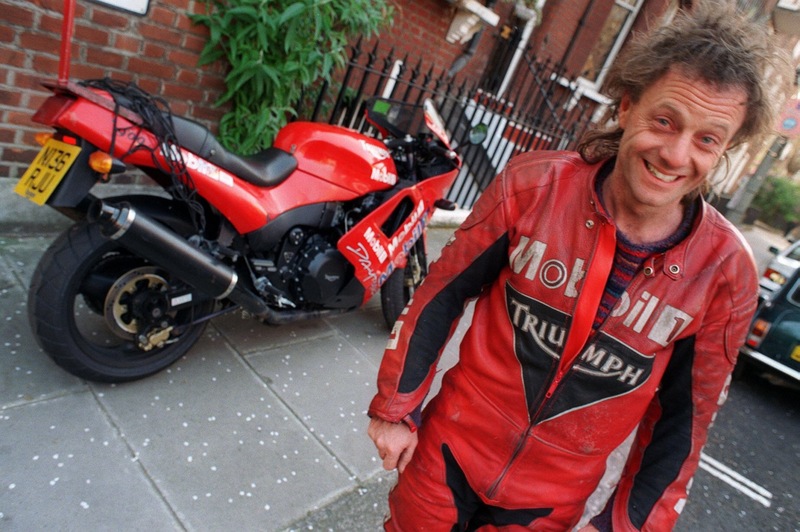 This is such a happy photo of her on a spanking new Triumph Speed Twin. Hatter – “in this style 10/6” At an average daily distance of 650 miles for one whole month you need to be slightly eccentric to ensure success.